Oakton Reads Jewish Literature | What's On My Nightstand? “David Grossman’s classic novels See Under: Love and The Book of Intimate Grammar, earned him international acclaim as an author of childhood. 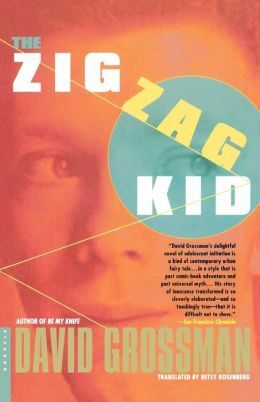 The Zig Zag Kid is written in a more optimistic vein, and recounts thirteen-year-old Nonny Feuerberg’s picturesque journey into adulthood. As Nonny’s Bar Mitzvah year trip turns into an amazing adventure, he not only finds himself befriending a notorious criminal, and a great actress, but confronts the great mystery of his own identity. With wit and humor, The Zig Zag Kid is a novel that explores the most fundamental questions of good and evil and speaks directly to both adults and teenagers” (Descriptive content provided by Syndetics). “Persian Brides is a novel of rare beauty and extraordinary accomplishment. Set at the turn of the century in the fictional Persian village of Omerijan, it tells the magical story of two young girls—Flora and Nazie Ratoryan—and their many neighbors in the almond tree alley in Omerijan where they live. Fifteen-years-old, pregnant, and recently abandoned by her cloth-merchant husband, Flora longs desperately for the return of her unborn baby’s father. Nazie consoles and pities her, and though she is still a child of eleven, she yearns—just as desperately—for her own future marriage. Although the narrative spans only two days, it branches out and back, encompassing the lives and histories of many of Omerijan’s inhabitants. Rabinyan’s vivid depiction of the village is a sensual feast, recreating the odors and flavors, the colors, sounds, and textures of everyday life. A masterful blend of fantasy and reality, the narrative forcefully conveys the shocking cruelties endured by many of the characters while at the same time weaving a modern-day Arabic legend where snakes offer jewels in exchange for milk and death is thwarted by appeasing the village demons. Written with passion and elegance, Persian Brides brings a rich array of characters to life—telling of their hardships without ever losing the magic and wonder that is so much a part of their lives” (Descriptive content provided by Syndetics). “In a gray and gloomy village, all of the animals—from dogs and cats to fish and snails—disappeared years before. No one talks about it and no one knows why, though everyone agrees that the village has been cursed. But when two children see a fish—a tiny one and just for a second—they become determined to unravel the mystery of where the animals have gone. And so they travel into the depths of the forest with that mission in mind, terrified and hopeful about what they may encounter. “A couple, long married, are spending an unaccustomed week apart. Amotz, an engineer, is busy juggling the day-to-day needs of his elderly father, his children, and his grandchildren. His wife, Daniella, flies from Tel Aviv to East Africa to mourn the death of her older sister. There she confronts her anguished seventy-year-old brother-in-law, Yirmiyahu, whose soldier son was killed six years earlier in the West Bank by ‘friendly fire.’ Yirmiyahu is now managing a team of African researchers digging for the bones of man’s primate ancestors as he desperately strives to detach himself from every shred of his identity, Jewish and Israeli. With great artistry, A. 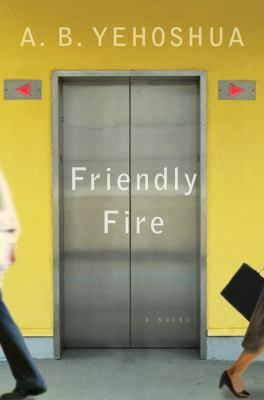 B. Yehoshua has once again written a rich, compassionate, rewarding novel in which sharply rendered details of modern Israeli life and age-old mysteries of human existence echo one another in complex and surprising ways” (Descriptive content provided by Syndetics). “Grandma Tonia was never seen without a cleaning rag over her shoulder. She received visitors outdoors. She allowed only the most privileged guests to enter her spotless house. Hilarious and touching, Grandma Tonia and her regulations come richly to life in a narrative that circles around the arrival into the family’s dusty agricultural midst of the big, shiny American sweeper sent as a gift by Great-uncle Yeshayahu (he who had shockingly emigrated to the sinful capitalist heaven of Los Angeles!). America, to little Meir and to his forebears, was a land of hedonism and enchanting progress; of tempting luxuries, dangerous music, and degenerate gum-chewing; and of women with painted fingernails. The sweeper, a stealth weapon from Grandpa Aharon’s American brother meant to beguile the hardworking socialist household with a bit of American ease, was symbolic of the conflicts and visions of the family in every respect. The fate of Tonia’s “svieeperrr”–hidden away for decades in a spotless closed-off bathroom after its initial use–is a family mystery that Shalev determines to solve. The result, in this cheerful translation by Evan Fallenberg, is pure delight, as Shalev brings to life the obsessive but loving Tonia, the pioneers who gave his childhood its spirit of wonder, and the grit and humor of people building ever-new lives” (Descriptive content provided by Syndetics). Look forward to reading up on persian brides and suddenly in the depths of then forest. The former sure sounds like a must read, and if what’s written here is spot on, well, I am going to definitely enjoy reading about the various village inhabitants and the weave between the real and the imaginary. And as for suddenly in the depths of the forest, the short description sure sounds interesting.